Essay from the year 2013 in the subject American Studies - Culture and Applied Geography, University of Groningen, language: English, abstract: The paper is about Canadian and American immigration policies. It discusses differences, commonalities and such. Which country has the better immigration system? 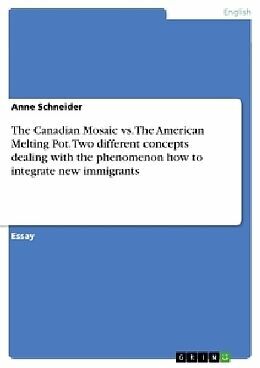 Over the last decade, the Canadian mosaic and the American melting pot have emerged in North American as concepts to explain Canada&apos;s and America&apos;s angle towards immigration and cultural pluralism. While many Canadians view the American melting pot as the total opposite of the mosaic, the two ideologies have much in common while examining the everyday realities of cultural pluralism in North America. In the following my intension is to illustrate on which concepts both immigration policies are based on, under which circumstances immigrants are allowed to move to the US and Canada by comparing the two immigration procedures, what the distinctive features between them are and in how far they are able to keep their promises towards new immigrants by looking at critics.